Mohammed El Raai/AP/Press Association Images. All rights reserved.When the final whistle sounded, tragedy ensued in Port Said. The attack came in waves. Swarms of unidentified men armed with knives, flares and rocks flooded the football pitch in pursuit of the Al Ahly team following their 3-1 loss to Al-Masry. The first wave targeted the players, dressed in their infamous red and white attire, and chased them off the field and into the relative safety of the locker rooms. The second wave of thugs focused on the Ultras fans. They encircled the infamous anti-authoritarian Ultras supporters, outnumbered and confused, and began the bloodiest massacre in Egyptian sports history. For those who watched the events unfold live on television on February 1, 2012, the chaotic scene was difficult to decipher, and very few could have anticipated the extent of the bloody violence that occurred in the stands, the locker rooms, and the tunnels leading towards the exit. Those who were able to fight their way to the tunnel were trampled as they attempted to exit the building – the gates had been sealed shut, enclosing the fighting from the outside world and ensuring the horrific fallout. 74 people were killed that day, including 72 Ultras supporters. 500 Egyptian citizens were wounded in the assault. Some were beaten to death with clubs and sticks; some were stabbed; others were trampled. The scene in the locker rooms hours later was as heart wrenching as it was traumatic. Those who survived the attack watched as medics attempted to revive their friends, and cried and moaned in pain for those who would not wake up. One screamed for his brother, seemingly unaware of the crimson mask of blood pouring from his head. The reckless passing of so much wasted youth angered the previously resilient Ultras, and began the slow decay of Egyptian football. In the aftermath of the Port Said massacre, the Ultras emerged as an overt political force that campaigned for retribution and justice while patiently awaiting the courts to rule in their favor. 73 culprits were arrested and put on trial for their actions. However, their faith in the judicial system appeared to have been in vain. Of the few police officers arrested, most were acquitted of all charges, while 21 hired thugs were sentenced to death. Several other thugs involved received life sentences, but most of the police force allegedly responsible and complicit in the attacks were either set free or never faced trial. Disillusioned, the Ultras decided to take matters into their own hands. The group began to pressure the authorities and demanded retrials. When they were ignored, Ultras members stormed the Football Federation and torched the Police Officer’s Club. They demanded that the Egyptian Football league be brought to a halt until the Port Said verdicts were read. They eventually got their way. Despite being out for violent vengeance, the group still had some sympathizers. Many, including foreign media sources, believed the attack was not the culmination of Egyptian hooliganism (already uncommon between opposing teams) but a politically motivated attack on the well-organized Ultras Ahlawy supporters who had been instrumental during the 2011 uprising. The football fans’ presence and exceptional influence during the revolution was undeniable, which caused many to believe that remnants of Mubarak’s regime had been settling the score. The massacre could also be interpreted as an attempt to intimidate them into never opposing future regimes. During the Ultras’ quest for justice for their fallen brothers in mid-2012, Egypt was preparing to host its first free elections since the fall of president Mubarak. The Ultras, a symbol of anti-authoritarianism and youth politics, became bastions of hope for religious parties that attempted to gather support. Of all civic organizations in Egypt at the time, the Ultras may have been the second largest after the Muslim Brotherhood. However, when Ultras members or factions campaigned for one party or another, it led to clear divisions in a once-united group. Political parties were able to hijack the Ultras’ longstanding fight with the old regime and bastardize their beliefs. The Port Said Massacre was the tragically pivotal moment that transformed a football fan club of revolutionaries into a political entity, and when the Muslim Brotherhood emerged victorious, the Ultras’ struggle took a turn for the worse. The Port Said massacre not only exacerbated Ultras participation in politics, but reinvigorated conservative campaigns against the Ultras and their supposed brand of football-violence. For many, the events that occurred that day were due to a lack of law and order and an impotent police force unable to complete their duty. Hooliganism was seen as the cause by many religious and conservative members of society. Ironically, the harrowing events that occurred because of a complicit and apathetic police force sparked a call for police reform and Mubarak-era law enforcement brutality to quench violence. Amid public opinion swaying against them and a newly-minted presidency unopposed to bringing about their downfall, the Ultras had been weakened beyond recognition. Clear divisions appeared among the groups, who began to voice different demands. Some called for revenge, others for police reform, while some demanded participation in politics. The fragmentation of the once-united revolutionaries was complete. 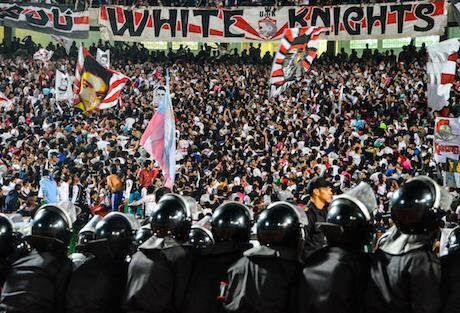 By 2013, the Ultras no longer had a clear set of ideals or even a football team to support. Police harassment increased and peaceful protests were quenched with decisive brutality. Those who once sympathized with the Ultras’ cause no longer preached their values or mouthed support. Egyptians were fatigued with the revolution, and the Ultras were a constant reminder of their failings since January 25, 2011. In a matter of years, the Ultras went from heroes and revolutionaries to terrorists and troublemakers. The final entry of this four-part series will look at the Ultras’ position in 2016 and analyze their complicated legacy.